Large corporations have been doing it for years and now smaller businesses are taking advantage of the trend; outsourcing. As more and more outsourcing companies appear in the market, small business owners now have endless options to streamline their services, products and workforce. That being said, even with all the publicity and success stories, many small business owners are reluctant to try these services and continue to carry out many of the time-consuming administrative tasks of their business. Delegating work can be difficult for entrepreneurs, no matter if the actual work takes place on or off the premises. Lack of delegation can negatively affect your business, especially if you spend your time on tedious administrative tasks instead of proactively adding value to your business. In ‘The E-myth’, author Michael Gerber asks entrepreneurs to reflect on how they spend their time in the office. “Are you working IN your business or ON your business”. In the perfect world, we should be spending a significant amount of energy working ON our business in order to improve our products, people, efficiency, and profits. We frequently hear this phrase from our customers. With this type of thinking it can become terrifying to hand over a specific function of your business to someone else. This is completely understandable and is also one of the main reasons why extensive research is required before you choose an outsourcing partner. Make use of online forums and Linkedin groups and ask fellow business owners which outsourcing companies have provided reliable, quality work. There are many great forums out there such as http://www.wholesaleforum.com/ where you can find relevant information about eCommerce outsourcing trends. Outsourcing certain functions of your business can make your day-to-day operations significantly more efficient. But what functions should be outsourced? As a general rule, do what you’re good at and let others do the rest. Obviously, that’s easier said than done, especially if it’s just you working in your business. However, the principle remains the same. Can the partner achieve the quality & delivery times I am looking for? We would like to illustrate both the time and cost savings that you can achieve by working with the right outsourcing partner. Here at Pixelz, we have helped more than 5000 online retailers outsource the product image editing process. Imagine you have to edit 1000 product images for your website. Each image will take you roughly 10 minutes to edit, depending on the product and complexity, meaning that you will spend around 166 hours editing images (1000 images / 6 images/hour). Alternatively you could hire an in-house graphic designer to do the editing for you. At 166 hours, this translates to roughly 1 month’s work at an approximate cost of $4,500 USD (according Indeed.com’s salary report for experienced graphic designers in the US). For most of our customers, 166 hours would be the minimum amount of time required to edit their images. If the customer is selling on their own website as well as online marketplaces such as Amazon and eBay, this time requirement can quickly increase. This is because the images for their own website often do not meet the requirements of online marketplaces. Now let’s see the same exercise using an external partner such as Pixelz. 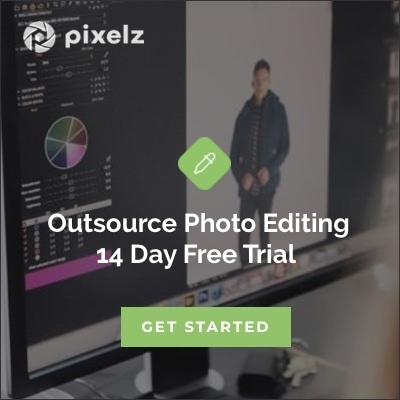 If we were to take on the same job of editing 1000 images, our expert image editors could deliver the same batch of images in 24 hours or less. This is a time savings of 86%. In terms of costs, outsourcing this work would cost $1450. This means, that not only would you save yourself 166 hours of work, you would also save more than $3000, a huge 68% reduction in costs. This is quite a simple calculation, but the consequences are massive. By allowing a third party to do the work for you, not only could you potentially get 29 times the number of images edited during the month, but you could also get your new products online weeks earlier, meaning you would also benefit from increased sales during that period. Now imagine if you could spend those 166 hours you saved on other value added activities such as sourcing your core product at a cheaper price, looking into new shipping methods or providing fantastic customer service, ensuring that your customers will come back again and again? It would be nice right? So if image editing is not your strong point, you’ll quickly notice that it’s actually more expensive for your business to keep carrying out this task internally. Take some time today to analyse which of your day-to-day tasks are time wasters and are good candidates to outsource. Find the right outsourcing partner, free-up critical creative time and start focusing your energy on taking your business to the next level.